Chicory grows around the world. This common weed frequently consumed in the human diet. Chicory root is usually roasted and consumed as a coffee substitute, while the leaves of different varieties of chicory, including endive & radicchio, are consumed in salads. 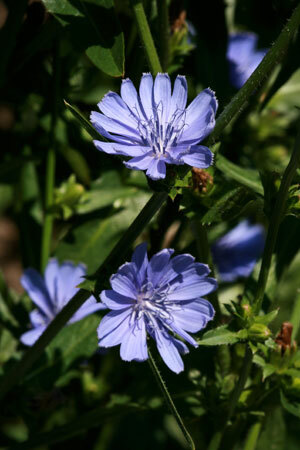 Herbalists primarily use chickory for digestive conditions. The ancient Greek physician Galen called chicory a “friend of the liver.” Like many bitter herbs, it increases the production and release of digestive juices, including stomach acid, bile, and pancreatic enzymes. Historically it was used for liver disease and associated jaundice and gallstones. Chicory contains lactucin a bitter substance classified as a sesquiterpene lactone. In addition to promoting digestion, this compound likely inhibits inflammation and the growth of micro-organisms thus explaining the other traditional uses of chicory such as arthritis, gout, and infections.